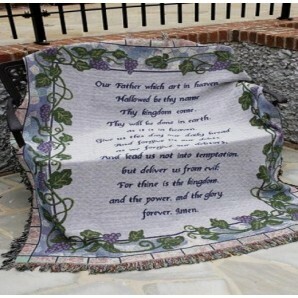 Tapestry depicts a pastoral church along with a verse from the song "Amazing Grace"
"Amazing Grace" is one of the most popular and most inspiring of hymns. This throw showcases the words from the first verse of this song against a colorful backdrop of a church in a flowery country setting. 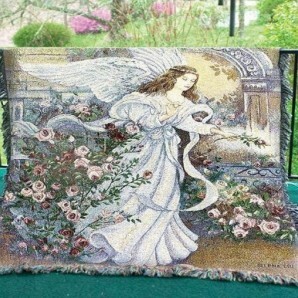 Rich greens, reds, browns, golds, and pinks create a lovely surrounding for words of faith. 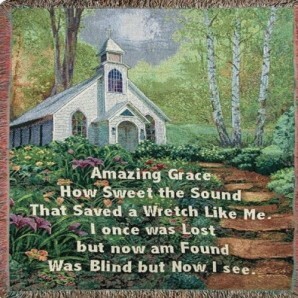 "Amazing grace How sweet the sound That saved a wretch like me. I once was lost But now an found Was blind but now I see."